Title: Official TEAM GB Olympic Rain Jacket. Also on sale the matching Athlete Issue Rare Pants in various sizes. 2018 / 2019 Official Winter Olympic Kit. Availability: Only available in size UK 16. 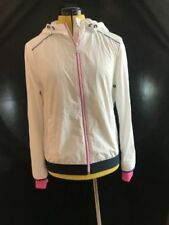 Ladies Superdry Sport Jacket / Hoodie Small Black Gym Running Good Condition zip up Please pay within 48 hours From a smoke and pet free home Happy bidding! Fab Adidas zip top matching crop top also for sale excellent condition From a smoke and pet free cared for home. Any questions please ask. Please see my other items as have lots to list. Womens Karrimor Running Jacket, Size 16. Purple and black with reflective detail. Quite roomy and windproof. Worn once until I decided running wasn’t for me. Condition is Used as I’ve worn it once. Dispatched with Royal Mail 2nd Class. Nike cotton blend full zip & hooded sports jacket in a very good and clean condition. 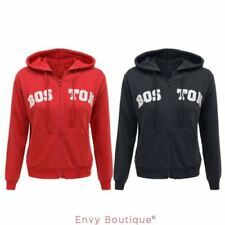 Hood with drawstring. Full front zip. Under sleeve length 21" incl cuff. Armpit to armpit 22". Back length neck to hem 24". 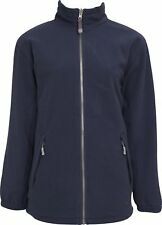 VERY STYLISH WELL FITTED LULULEMON DEFINE JACKET. Fitted sport jacket, designed for close fit. I bought it for my daughter but got the size wrong I though 10 was UK size, but it is far too big, I believe it is UK size 14. The Cagoule ThermoBall™ Jacket reimagines our classic 1970s Cagoule as a cosy hooded anorak that will keep you warm and dry for your adventures this season. Cagoule celebration label inside. 1/2 zip hooded anorak. 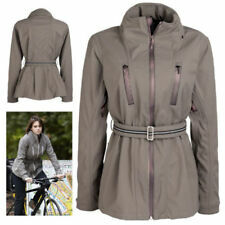 It has a zip fastening, zip pockets and an allover striped pattern. Treat yourself! Length; 26". Bust/Chest; 40". Sleeve; 33". Back length from center bottom of collar. front length from bottom of collar to hem. Size in label : L, Women's, check given measurements. Chest : armpit to armpit - 20ins, 51cm. Length : nape of neck to hem - 27ins, 69cm. Sleeves : armpit to cuff - 21ins, 54cm. Colour : blue Features : two side zip pockets, elasticated waistband & cuffs. Condition : excellent used condition. 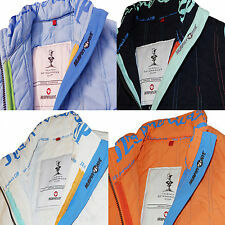 Ladies light blue Fred Perry tracksuit top jacket Size 10. Condition is Used. Dispatched with Royal Mail 2nd class. PLEASE CHECK OUT MY OTHER ITEMS FOR MORE FANTASTIC BARGAIN JEANS & MORE.... BID WITH CONFIDENCE!! SEE MY 100% POSITIVE FEEDBACK!! Please feel free to ask any questions...thanks for looking and good luck!! We scrutinise every item and point out any major defects. Size - UK 6. Lululemon Black / White Ombré Scuba Jacket. 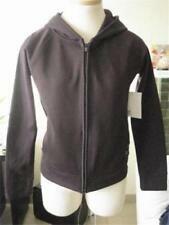 - Lululemon Logo appears across the front as well as on the hood. - Thick, heavyweight Jacket. - White to Black Ombré Combination. Size CAN 6 / AU 10. Very good preowned condition. 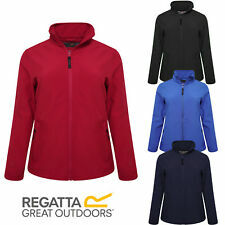 Regatta Black Soft shell Outdoor Jacket 18. Condition is Used. Dispatched with Royal Mail 2nd Class. BARBOUR INTERNATIONAL POLAR QUILT JACKET IN NAVY BLUE. SIZE 18 UK/44 EU/14 EU. - Machine wash. - Black Polarquilt Jacket. - Biker style. - Outer: 100% polyamide. Lining: 280g polarfleece. 💗• Colour: Figue. 💕• Lululemon. 👚• Define Jacket. Ⓜ️ • 87% Nylon, 11% Lycra. I MAKE these things my responsibility. I will sort every problem, but I cannot fix problems I dont know about. All I ask is. Great jacket, perfect for layering. Lovely shade of blue/green that I think is described as teal. Although this is from the kids range, it’s large and easily fits a UK size 10/12. Measures approximately 20” from armpit to armpit and approximately 19” across the waist. Machine washable and dries in minutes. In good used condition, freshly laundered. Will be posted promptly by second class post. Please have a look at my other items as I would be happy to combine postage. 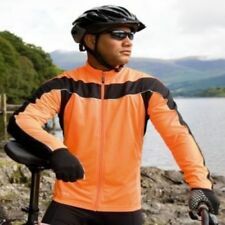 Ladies Size 10 Karrimor Running Jacket hi vis. Condition is Used. Dispatched with Royal Mail 2nd Class. Adidas Womens clima365 Running Jacket With Removeable Sleeves Sleeves removed to be a running Gilet Condition is Used. Dispatched with Royal Mail 1st Class. Vintage Adidas Hoodie Hooded Track Jacket, Womens Size 10. Colour is closer to 2nd pic. Very good vintage condition. Small amount of pilling on fabric, barely noticeable. Fab Adidas top matching jacket top also for sale excellent condition Please note needs stitching on seam see photo From a smoke and pet free cared for home. Any questions please ask. Please see my other items as have lots to list. COLOUR RIVER ROCK / GREY. Cat Number: 683938 012. Size: Small. 100% Genuine Item. Thermore High loft and warm, soft and comfortable. FACE OF FABRIC-100% NYLON. BACK OF FABRIC-100% POLYESTER. Elongated silhouette enhances coverage. Nike Sportswear Down-Fill. Pockets are lined with soft fleece fabric. Body/centre-opening trim fill: 100% polyester. Panel/lining: 100% nylon. Fill: Minimum 75% grey duck down or minimum 75% white duck down, depending on colourway. Sw ea ty B et ty h ig hl an ds 3 i n 1 co at. SizeS ma ll. De ta ch ab le Sherpa lin ed j ac ke t. Sherpa lined d et ac ha bl e gooda nd j er se y li ni ng throughout ma in body. B ig r oo my p oc ke ts a nd b ac k he m is d ro pp ed f or a n ed gy l oo k. O ff w hi te /i vo ry colour way. Also the zipper may have once had a puller but is now just a cord. Underarm to hem 19". Colour: Guava Ice. Fabric: Body/panels lining: 100% polyester. Knit cuff/collar facing: 92% polyester/8% elastane. Machine wash. Stretch cuffs help keep the jacket in place. Style: 929119-838. Nike Tech Fleece fabric feels soft, light and warm. Colour: Carbon Heather/Black. Side zip pockets hold your keys and cash. Machine wash. Fabric: 67% cotton/33% polyester. Raglan sleeves allow a natural range of motion. Nike dfc fz jacket. 100%authentic.